You know, where you can frolic with foxes. 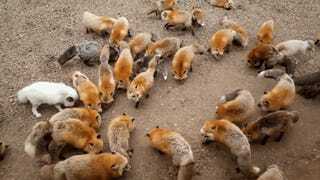 Opened in 1990 and located in Miyagi Prefecture, "Zao Fox Village" is a sanctuary home to over a hundred free-roaming foxes, including the silver fox and the platinum fox as well as the Japanese red fox. You can get close to the animals, so in that regards, the fox village is kind of like cat island or bunny island. Here, you can visit and feed foxes. In total, there are six different breeds at the park. 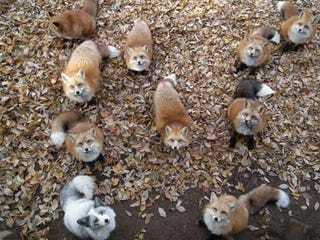 Look how the foxes swarm! Like in the West, foxes are seen as exceedingly clever in Japan. They are also believed to have the ability to shape shift and develop multiple tails. Foxes also have religious connotations. They are the messengers of Inari, the Shinto deity of wealth, prosperity, and rice. 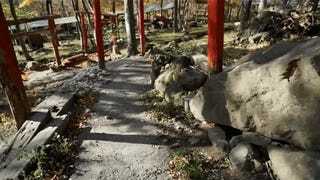 So yes, there is a Shinto shrine to Inari on the reserve's premises. How fitting is that? As Japan Travel explains, you purchase fox food for 100 yen (less than a dollar), but the park doesn't recommend feeding the animals by hand. Also, this might not be the best place to take small children, because, as cute as foxes are, they're still wild animals and not really kid-friendly. Visitors can get quite close to the animals, which have free reign of the sanctuary. But once again, it's not recommend that you try to pet the animals. And please don't bother them if they're curled up asleep! Though, some of the fluffy foxes appear more amicable than others. Still, you might not want to try your luck! This little fox is pretending not to follow the person with the camera. If you want to snap photos or just hang out with the foxes, there are few places that offer an experience like this.